Effective governance is the core responsibility of any board of directors. To govern effectively, your board of directors needs talented, dedicated directors who passionately believe in your organization’s mission and vision. However, talented and dedicated directors alone are not enough to ensure effective governance. An organization’s systems, structures, policies and procedures, and strategy help foster an environment where sound governance thrives. 1. Have clearly defined roles and responsibilities on your board of directors. Too often boards lack job descriptions for both officers and directors. A president or chairman knowing they run board meetings and a treasurer knowing he or she is responsible for presenting the budget is not the same thing as a formal job description. You can start with a template and, using BoardPaq’s “Forms” feature, customize it to fit your organization. Your directors and officers will appreciate knowing what is expected of them, and how they can measure their own success. 2. Create polices and procedures to help deal with the unexpected. In addition to job descriptions, creating policies and procedures is an important aspect of effective governance. Board meetings and decisions are frequently routine. However, there are instances that even the most experienced board of directors haven’t confronted. For example, conflicts of interest can create unique challenges. In addition to conflicts of interest, conflicts between board members can also occur—and when they do, they can damage a board’s ability to govern if handled ineffectively. Creating policies and procedures that help guide your board when the unexpected occurs will help maintain the board’s ability to govern, even when challenges arise. 3. Foster an environment where directors feel confident questioning the status quo. There is a difference between rubber-stamping and effective governance. Most board decisions are likely to be unanimous, with little dissent or conflict. However, a board that simply rubber-stamps the decisions of leadership is not governing effectively—or taking the type of bold action that on occasion is both controversial and essential to keeping its organization relevant to its stakeholders. Encourage healthy dissent and disagreement. Make sure diverse perspectives and experiences are well-represented on your board. Don’t let meetings devolve into screaming matches, but do understand that effective governance and easy governance are not the same thing. Of course, when those moments of dissent get out of hand, make sure you refer back to #2. 4. Create a strategic plan. The theme of this post? And one of your organization’s most important (though adaptable) structures is your strategic plan. Without direction, every organization flounders. That’s true for governments and huge corporations. It’s also true for small nonprofits, co-ops, community banks, trade associations, and school boards. A well-developed strategic plan, based on a thorough SWOT analysis, will help your board of directors govern more effectively. After all, the point of good governance isn’t to run a good meeting. It’s to achieve the results your stakeholders expect. • Dynamic Forms Builder & Reporting, a feature that helps your organization create forms that are essential to effective governance, including job descriptions, conflict-of-interest forms, polices and procedures, and other documents that will help your officers and directors understand exactly what is expected of them. 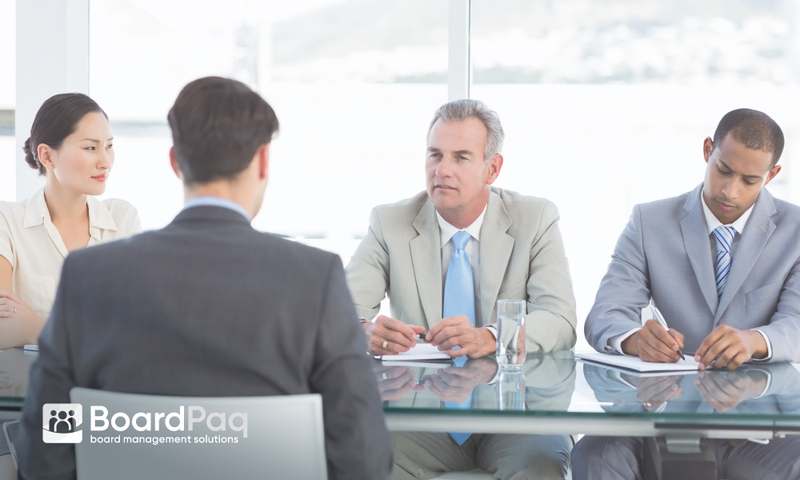 • Meetings, a core component of the BoardPaq platform that allows administrators to assign and track tasks, record minutes and attendance, track votes, and provide the structure effective governance requires. • SWOT Analysis, a collaborative tool that helps board members and other participating stakeholders assess the strengths, weaknesses, opportunities, and threats facing your organization. The SWOT analysis should form the foundation of the strategic plan your board creates. These features and more are available in the most affordable and value-added board portal on the market. That’s why school districts, trade associations, nonprofits, rural cooperatives, community banks, credit unions, economic development agencies, colleges and universities, and other board-led organizations use BoardPaq to run efficient, paperless board and committee meetings.